As readers of my posts know, around early January 2017, I took delivery of my very first refractor with a view of developing my interest in Astrophotography. While I haven’t used it as much as I would like to have by now (primarily because of the weather), I have at least had some use out if it. Enough so I feel I can now put my first impressions of the new scope to type. So, the Altair Starwave 80 ED-R refractor. 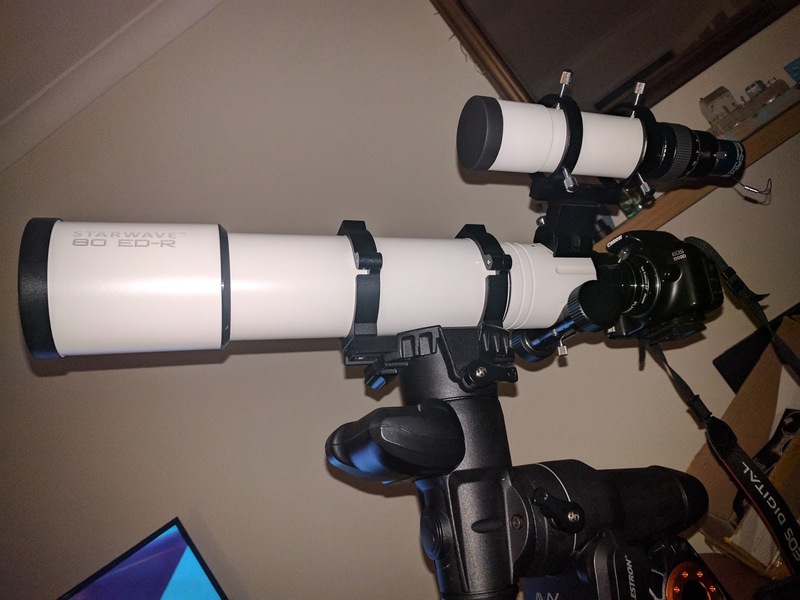 It’s a bit of kit I first considered getting after attending Astrocamp and seeing some of my astronomy friends with their own 80mm refractors. But I didn’t know which I would like to get for myself. I come across the initial Starwave 80 ED during a visit to Astrofarm in France where I also met Andrew who was able to show me his and demonstrate it’s capabilities. By the time I returned to the UK and decided on the fact that the Starwave 80 ED would be a good choice for me, I couldn't find one anywhere. They had been replaced by the 2016 80 ED-R version instead. After further deliberation, I decided to bite the bullet, and go with the latest version, assuming that the new scope wouldn't be a backwards step. I ordered the new telescope along with a 50mm guide scope package from my regular astronomy retailer, Tring Astronomy. The boxes arrived in good time as arranged. It was time to get stuck in. Mt first impression was that it’s a solid piece of kit. It’s well manufactured and finished extremely well. A very gentle shake (always a good test!) suggested that there was no movement in any of its components. Nothing loose or rattling. I was slightly disappointed at the point of ordering the scope to learn that a case was not included for this refractor. 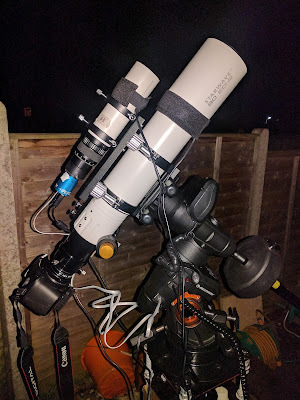 The cardboard and foam packaging won't last too long in damp late night observing conditions, so it is worth considering the extra expense that will be required to buy or build a suitable case. Once out the box, one of the first jobs to do is to locate the small mounting plate for attaching a finder scope, and attach it to the scope. It's quite easy, just a couple of hexagonal bolts which are already in situ in the side of the scope are all that are needed. The fitted mounting plate for a finder scope or guide scope. Before I could do much else, I needed to put the scope onto a mount which would then allow me to get a proper look at it. 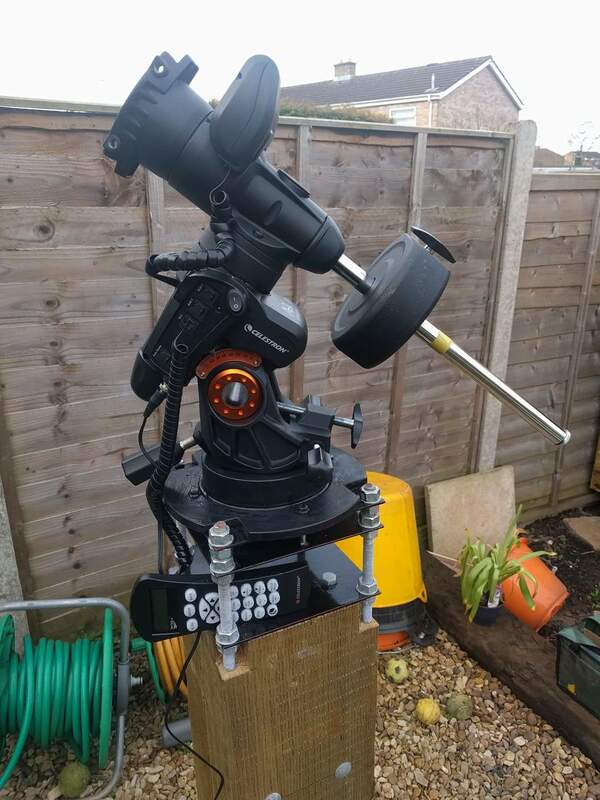 The scope came mounted in it’s rings and with a dovetail bar attached which meant that I could get it on the mount straight away. In that sense, it was ready to go straight out of the box. Very simple, very easy. The telescope comes with an short extendable dew shield with is pushed out and held in place by friction. Although, after several times of setting this scope, and then packing it away again, this is becoming a little loose. However, there are 3 small grub screws in place that can be turned slightly to help the dew shield stay in place. I will need to remember to loosen these off each time in case they start to mark the tube of the refractor over time. An excellent touch is the cap for the scope. One of my reflector telescopes came with a plastic cap for the end of the tube which was fine. But the dobsonian telescope come with a shower cap style cap for the secondary end. It’s inevitably going to get lost or torn at some point. But, the cap for the refractor is a really snug fitting metallic cap which fits really well. It doesn’t take too much effort to remove it, and you certainly don’t need to give it a series of sharps taps to put it on. At the other end, the focuser is smooth as they come. My other two scopes are reflectors. One has the factory fitted Crayford style focuser and the other has an upgraded dual speed focuser. Both very capable and suitable focusers. In terms of focus action though, this rack and pinion focuser is so smooth. It is dual speed for the fine-tuning capabilities oh so very important to astrophotography. There is also a small thumbscrew under the focuser to lock the focus into place, critical for imaging. Staying at the focuser end of the scope, the 80 ED-R comes with a 2” to 1 ¼” adaptor for eyepieces. To start with, I only wanted to use the new scope for photography, but I soon decided that it would be better to use it as a travel scope as well as for AP, and therefor would also need a 2” diagonal as an add on. As I found, this was also required to achieve focus with an eyepiece in place. My attempts at astrophotography involve me using my Canon EOS 1100D DSLR. 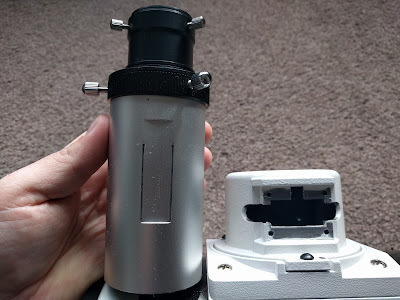 When I bought the refractor, I also bought a reducer to use in conjunction with the DSLR. Fitting the DSLR with reducer and adaptor is all very straight forward. I use Backyard EOS with my DSLR to help construct imaging runs. The software has a focus guide that can be used in conjunction with the live view functionality with the camera. 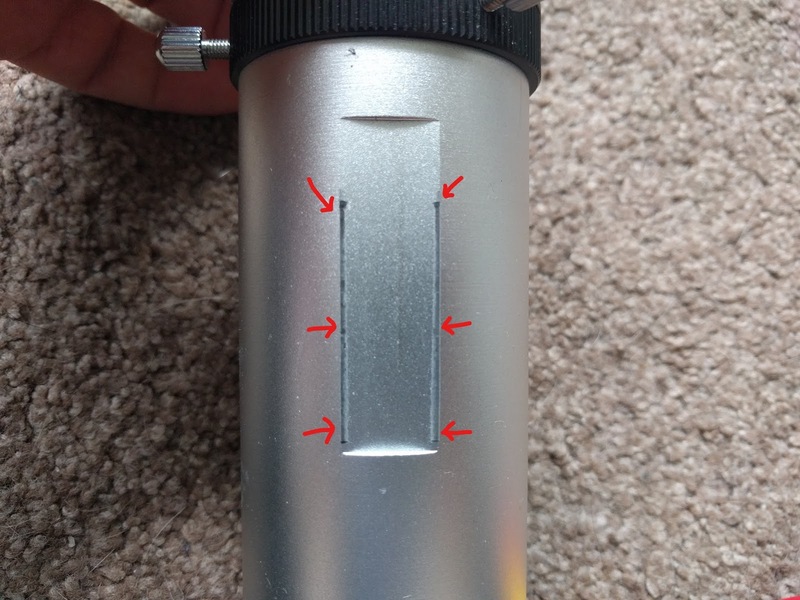 When I have used this in the past with the reflector telescope, I could get the focus value down to around 6, the idea being the lower the number, the sharper the focus. At first light with the new scope, I achieved the best focus I ever have, with a value of around 2.4. This must be testament to the optics in the refractor. My first test sub frame take with the scope was extremely sharp. I used the DSLR at a relatively high iso so I could get some instant results, but I was in no way disappointed. Though quite ‘noisy’ in general, (a limitation of the cameras performance as opposed to the scope) the image was crisp to the edge of the image. 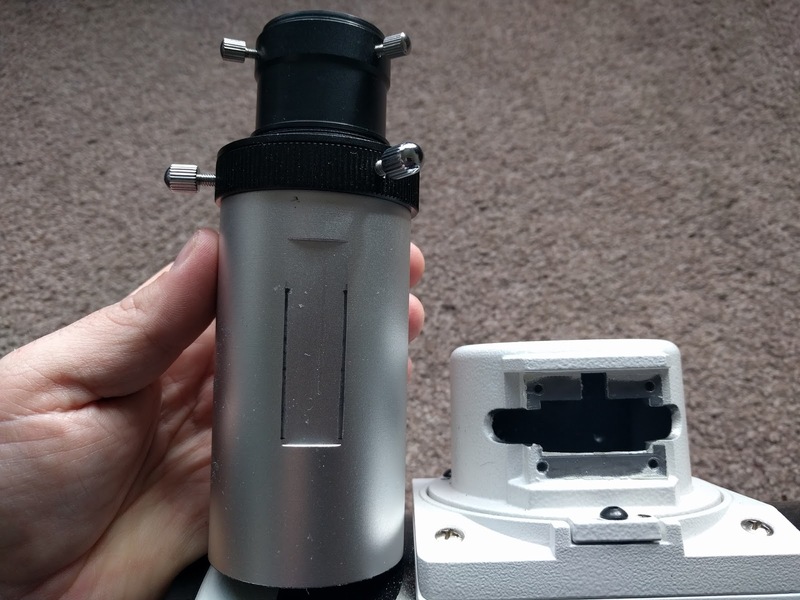 The telescope comes with a fitting for a finder scope if you wish to use one. However, along with the 80 ED-R, I also bought a 50mm Starwave guide scope kit. This kit comprises of a 50mm aperture, 200mm focal length guide scope and Altair’s GPCAM mono. The guide scope comes with it’s own scope rings and mounted on a guide stalk. This fits directly into the finder scope mount on the main telescope. It was at this point, I found the only minor problem with the purchase. If the guide scope and camera are mounted onto the 80 ED-R in the suggested fashion, and then a DSLR is attached to the focuser, the whole ensemble does not balance on the mount. There simply too much weight present on the focuser end of the rig. Loosening off the clutch on the mount just sent the whole scope spinning around until scope pointed up in the air and focuser towards the ground. I had to look at options of how to combat this issue. I needed to get some of the weight further forward towards the dew shield end of the scope to try and achieve a better balance. By looking around at picture on other users set ups, I could see that a more popular way of arranging a guide scope to work with a telescope is to piggy back the guide scope onto the back of the telescope. Fortunately, I had a spare dovetail bar, and I could drill some suitable holes in it. The new holes allowed me to piggy back the spare dovetail bar to the scope rings of the 80 ED-R. Following from there, I could also then attach the scope rings for the guide scope. All of this means that the weight of the guide scope kit at least is distributed further forward and along the length of the telescope. It still doesn’t balance perfectly, but it much better that it was. The piggy back method of mounting the guide scope means that the weight of the scope is much further forwards. With the weight of the DSLR, balance is still not right, but it is better. So, they are my first impressions of this impressive piece of hardware. 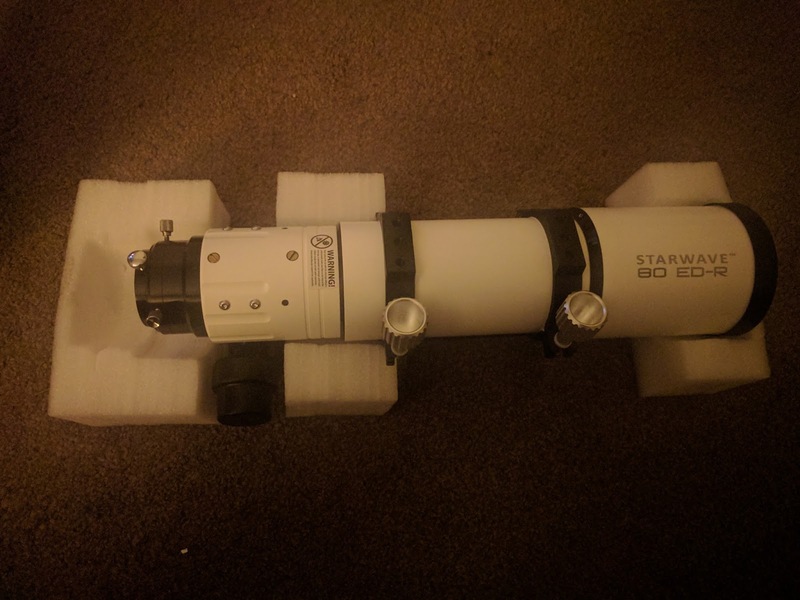 It's my first refractor, so I have nothing to compare it to in terms of refractor optics, but I am really pleased with the purchase. Now all I need to do is get out there and use it more! The early part of the season has been a little underwhelming in terms of astronomy for me. While great swathes of the country at times seem to be basking under clear skies from dusk until dawn, our little corner of Herefordshire has been sitting quietly under a mirth of cloudy foggy mess. On the rare few occasions that my work and play time have combined with the weather to allow for astronomy, the window of opportunity has been very short. So, it was an extremely pleasant surprise when I checked the weather forecast during a quiet moment in work, and I saw the much treasured moon symbols across the weather app on my phone stretching into the early hours. It was time to put the Starwave to it's intended use. Having been through the process of setting it up and having small windows of opportunity to tinker with with the scope in the past couple of months, I'd taken the opportunity to make a few marks on the mount and on the pier to get my alignment pretty good from the start. Thanks to Venus still being visible in the dusky sky, I could get the scope, finder-scope and guide-scope all lined up before darkness really set it. When I bought the scope, I also bought a 50mm Altair guide-scope package with it too. This was with the intention of making use of the AVX mounts guide port and guiding capabilities. As yet, I haven't had time to set all that up and learn how to using the PHD guiding software. That will come. But what I have used is the free SharpCap software in conjunction with the guide scope and GPCAM to help with my polar alignment. Without going into the details, it makes the job very easy, and has so far to be proved extremely accurate. This is very important when it comes to unguided astrophotography. Perhaps more on that in another post on another day. My target for the evening's photography actually included 3 well defined targets all in the same field of view. M81, known as Bode's Nebula and M82 also known as the Cigar Galaxy are a pair of spiral galxies which are joined by much dimmer galaxy designated NGC 3077. Through the eyepiece of the refractor, M81 and M82 were only just visible. 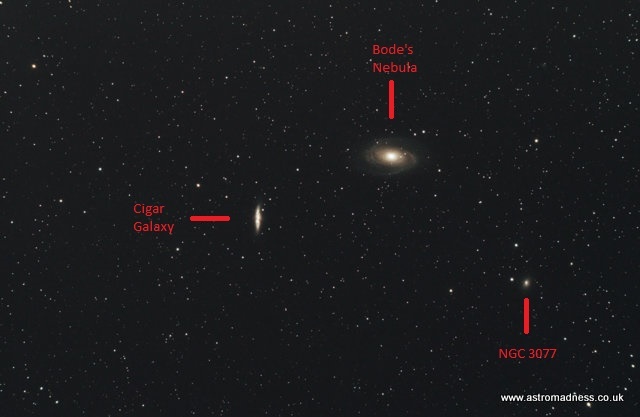 I could not see NGC 3077 at all. 30 x Light frames of 90 seconds at iso 1600. 15 x Dark frames of 90 seconds at iso 1600. 15 x Bias frames of 1/4000 second at iso 1600. 15 x Flat frames at the same focus with the DSLR set to auto. All taken with an unmodded Canon EOS 1100d DSLR and focal reducer. No Filters. Altair Starwave 80 ED-R telescope. 95% of the Light frames were used in the final stack giving a total exposure of 42 minutes. Frames stacked in Deep Sky Stacker. Post processing in Adobe Photoshop CS2. DSLR sensor temperature remained around 20c throughout. Once all the data was collected and stacked, I started processing the image, saving several versions along the way. Processing the image has proved to be extremely challenging, but fortunately, now I have all the data, it's something that I can revisit time after time as my processing improves. The following pictures have all come from the original stacked result. The 3 objects all framed in the same field of view with very slight cropping applied to aid the initial processing. 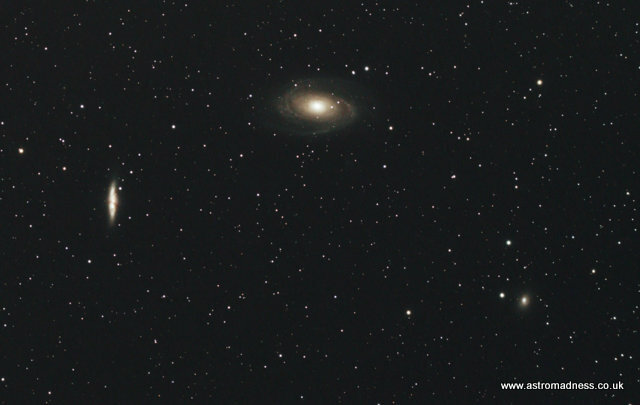 A little more processing, and then cropped to frame the 3 galaxies in the picture more centrally. 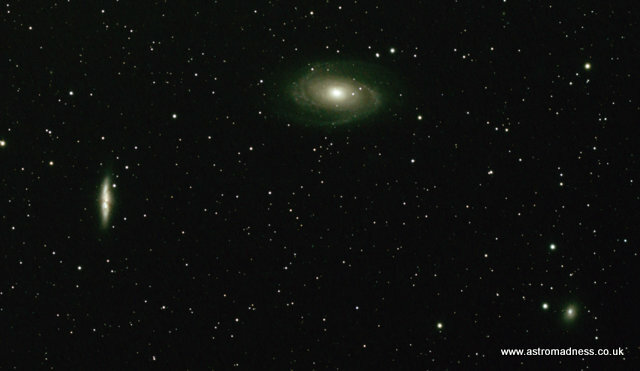 A little more cropping and processing including some colour enhancement to bring out the dust lanes and the arms of M81. So, for the moment, this is as best as I can get the image. It's probably taken an hour or two to get it this far. When the original picture is viewed at full size, the picture is quite noisy, probably due to the high iso used when gathering the data. The next time I take this sort of image, I will probably used an iso of 800 or 400, and, providing my polar alignment is right, I will increased the exposure time up to 150 or 180 seconds. What I am pleased with in this set of data is the focus achieved using the refractor, and also the quality of the tracking. I have not been able to find any sign of star trailing in the original pictures which will encourage me to increase the exposure length next time. Taking the focuser apart is easy. Very easy. On the 150p, the focuser is only held together by 4 screws marked by the red dots on the picture below. Take the screws all the way out and set them to one side. When the plate is removed, the simplicity of the inner workings of the focuser is revealed. 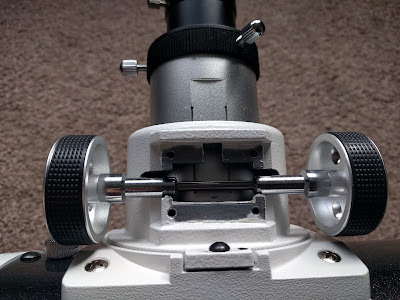 Under the plate, you see that the focuser relies on nothing more than friction between the flattened edge of the focuser tube, and the bar that joins both the focus wheels together. Looking under the plate you have removed, you can see how the bar sits and is held into place. The focus tube is free to be pulled out of the side of the telescope. While I had the focuser in pieces, I gave it all a clean, getting rid of some grime that had built up over time. I had read that one way to improve the operation of these standard focuser was to do some work on the focus tube itself. Looking at the picture of the focus tube below, you can see two dark lines that appear along the edges of the flattened part of the tube shown with red arrows. This is where the friction is created, moving the tube towards and away from the secondary mirror. To increase the amount of friction created on the tube, I've read that you can take a piece of wet and dry sand paper wrapped around a small block, and gently rub the flat section. By doing this, you will gradually work down the edges of the flat section where the friction is created at the moment, and expose more of the tube to contact with the focus knob bar. Eventually, the friction will then be created across the whole width of the flat section, not just the edges. Seeing how it all works, it was time to put everything back together by putting the tube back into place, replacing the focus wheels and finally reattaching the plate that holds it all together. So far, this post has looked at the simple process of taking the focuser apart to find out how it works, and, if you want, where you can sand down to provide more surface area and friction to smooth out the operation of the focuser tube, In essence though, you don't need to do any of this if you only want to make a small adjustment and increase the friction placed on the tube and avoid the slippage. All this is done by turning one small grub screw as pointed out with the screw driver below. In my case, I needed an allan key, but I suppose it is possible that some focusers might have a small screw there instead. And there you have it. The grub screw tightened, camera attached and the tube moving in and out smoothly with no slipping. Tidy job. Converting My Pier for the AVX. A couple of years ago, in an effort to speed up the amount of time it was taking me to set up my Skywatcher EQ 3/2 mount, I went through the process of designing and building a pier for use in the back garden. 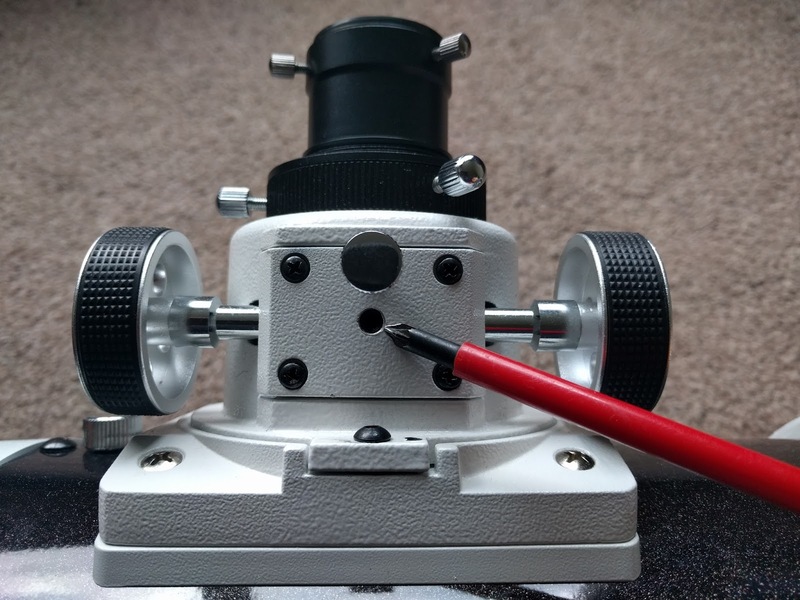 I documented the build process on the DIY Astronomer page of this site. The process of designing and building the pier was good fun. Something I could really get stuck into and would keep me amused during my spare time. I did use the pier for a while, and it proved to be a great success, decreasing the amount of time it was taking me to set everything up by quite some margin. But - there's always a but - when I took delivery of the 300p dobsonian, I found myself using that more than the 150p, and so the pier eventually went unused for over a year. That was until I went ahead a bought my first GoTo mount, the Celestron AVX. Soon, I found myself back going through the same process of setting up a tripod, getting everything leveled and polar aligned. In other words, back where I started with the EQ 3/2 mount. My latest ventures have seen me taking steps towards bringing together a reasonable low-end astrophotography set up. This is very time consuming, so any time saving tricks I could take advantage of are very helpful. There was nothing for it. It was time to breath life back into the pier, see how it could be adapted, and start using it for the AVX mount. The construction of the pier as it was saw the top plate being cut to size specifically to accommodate the base of my older Skywatcher mount. I had adjusted the plate height so I could get an M10 pier screw up through the steel plate and into the base of the equatorial mount. Finally, I measured and drilled a hole for the alignment peg so it would marry up with the cavity in the base of the mount provisioned for the alignment peg. The AVX mount has different dimensions to the older EQ mount. Obviously, coming from different manufacturers, the measurements were all different. First of all, I checked to see how far off the existing set up was from being usable. I found that the AVX mount wouldn't fit into the top plate in the same way that the Skywatcher mount did. The hole was too small. Initially, I considered taking the plate back to where I got it from, and then ask them to make a new one with a bigger hole. However, this would only solve part one of the problem. 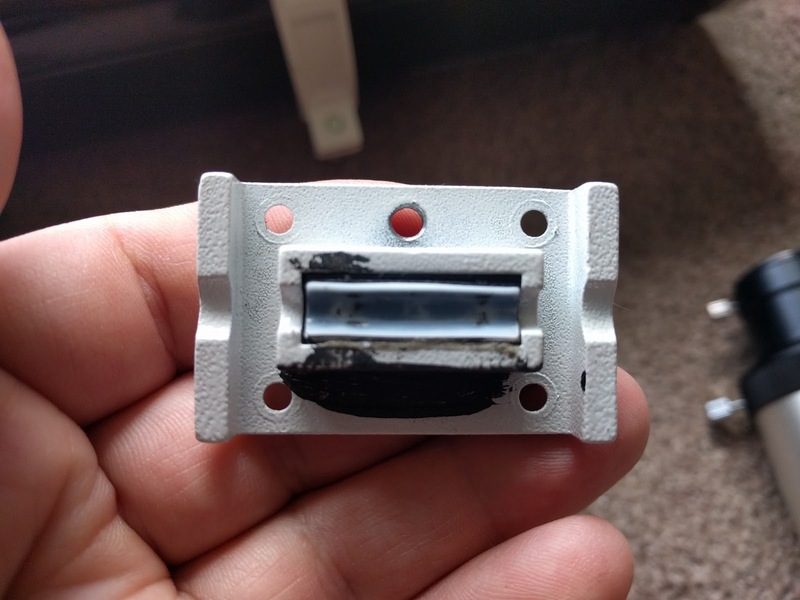 The design of the AVX mount meant that if I had merely substituted the top plate out for one of the correct size, the mount itself would sit too low on top of the pier, and it's range of movement would be inhibited by the corners of the top plate. 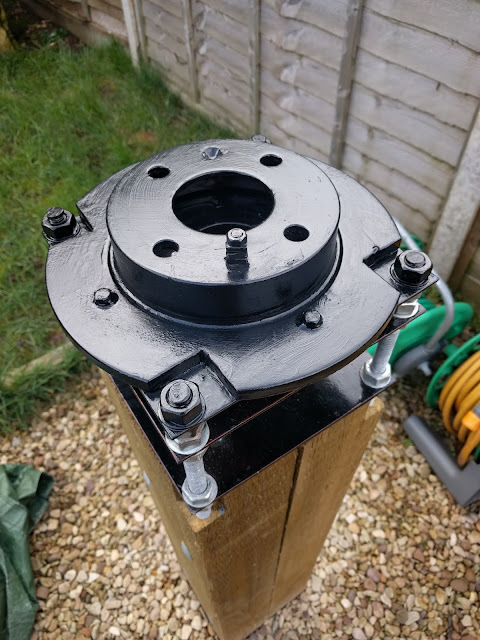 I needed to not only have a hole of the correct diameter for the AVX mount to fit into, but also raise the height of the mount by approximately 40 mm so the counterbalance bar wouldn't make contact with the top of the pier. The solution was already out there in the form of this pier adapter sold by Altair Astro. But at nearly £80 at the time of writing, plus delivery, it was quite an expensive purchase to address the problem. Again, not for the first time, I turned to the forums for help, and found loads of ideas. Through my research and reading, I come to the conclusion that what I needed was a brake disc. 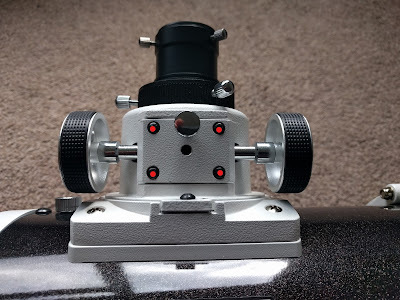 All I needed to do was measure the size of the whole that I needed for the AVX to sit into, and remember that I needed to raise the height of the mount up by that crucial minimum of approximately 40mm. A quick web search was able to provide me with a catalogue of brake discs and their full dimensions. It was just a question of working through the catalogue until I found one with the correct height and size hole. As it turns out, a 1995 1.4 Ford Fiesta was the correct one for me to use, and I could take delivery of a pair of them for around £16. Much cheaper than the purpose built option from Altair Astro, and I would have a spare in case something went wrong. I took delivery of the discs a couple of days later and set about offering one up to the top plate of the existing pier head. I established that I would need to cut out 4 sections from the disc to allow it to sit flush on top of the existing plate. Then simply drill and bolt the disc into place. The 'first fix' of the brake disc onto the pier head. One coat of red oxide and a first coat of metal paint to stop the disc from rusting. The first fix and initial cutting and drilling completed, I was able to start looking at how much adjustment was needed on the middle plate. 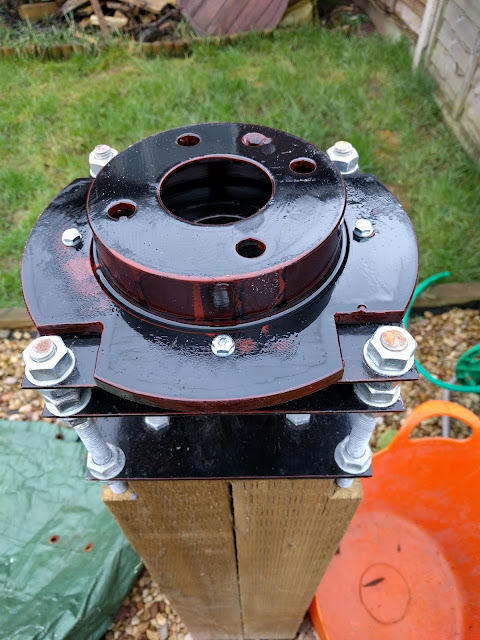 The height of this needed to be changed so I could fit an M10 size pier anchor bolt up inside the pier head, but also have enough available to screw into the AVX mount itself. Adjustments made, it was time to offer the AVX mount up once again to check everything was correct. I spent some more time making sure everything was level and then tightened up all the fittings. I still had the alignment peg to fit. It's tricky to do this during the day. The old alignment peg was always a little bit off I felt, so I didn't want to rely on that as a guide. I decided the best option was to make an initial mark on the brake disc showing magnetic north, and then to wait for a clear night where I could see Polaris through the finder scope hole of the AVX. Once aligned like this, I could make a few more marks, and return in the day light to drill the hole for the peg and fit it into place. Another couple of coats of paint, and the new pier head was complete. 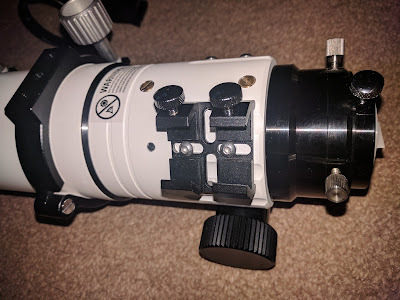 Instead of going through the expense of trying to buy a purpose made alignment peg from Celestron, I just used an M5 bolt with several nuts screwed onto it. The newly adapted mount was now ready to take the AVX. There are a couple of new modifications I could make to the pier now. The most notable and useful will be a holder for the hand controller of the mount. For the time being though, it can just rest between the top plates. And there you go. Thanks for reading, and Clear Skies!